ADDIS ABABA, Jun 30 2013 (IPS) - Across Africa, smallholder farmers, who are some of the world’s most impoverished people, are slowly being introduced to innovative approaches, such as entrepreneurial loan schemes and conservation practices, to combat food insecurity. Resource-constrained African smallholder farmers contribute to 80 percent of food production in sub-Saharan Africa, according to the Food and Agriculture Organization of the United Nations (FAO). But investment and support for agriculture in Africa must be innovative and aim for nothing less than the transformation of smallholder farming practices, according to Chris Henderson, a policy adviser at Practical Action, an organisation that champions agro-ecological approaches to increase global food sovereignty. “Transformation of smallholder farming systems should be an important part of the solution to providing food security, improved nutrition and equitable growth in African countries,” Henderson told IPS. He was speaking ahead of a two-day high-level international meeting on ending hunger in Africa, which is being held in the Ethiopian capital Addis Ababa from Jun. 30 to Jul. 1. It is organised by the African Union, FAO and Instituto Lula, a foundation with the backing of former Brazilian President Luiz Inácio Lula da Silva. Experts say that meeting the challenge of boosting food security in African countries requires pioneering solutions so that farmers can grow enough food to feed a population that is expected to reach two billion by 2050. One Acre Fund is an ambitious NGO that calls itself a business for Africa’s farmers. By providing loans in the form of agricultural inputs and technical support to poor farmers, it aims to double their income per half hectare. The fund uses an innovative business model where farmers apply for agricultural development and receive a loan of 80 dollars worth of seed and fertiliser. Each farmer signs a contract that binds them to repaying the loan, an added service fee, and a flat rate of 16 percent interest, in cash by the end of the agricultural season. 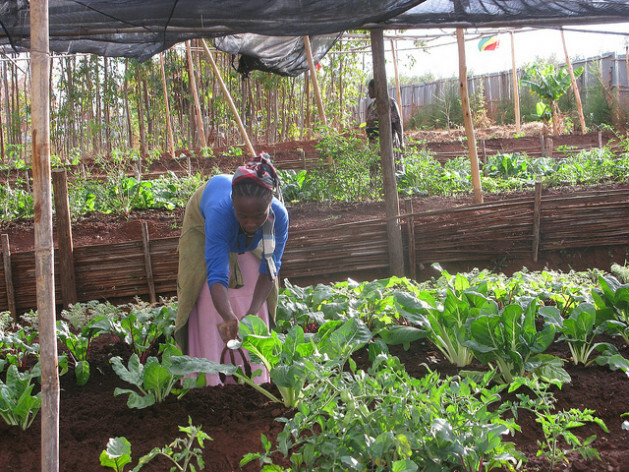 The One Acre Fund began in Kenya in 2006. It currently serves 125,000 farmers in Kenya, Rwanda, and Burundi. Within three years, it aims to represent Africa’s largest network of smallholder farmers. The fund also has something called a market bundle, which is another approach to helping subsistence farmers to “grow” themselves out of poverty with a view to enhanced trade and market access. This consists of identifying existing local farmer groups, providing them with an education on how to improve their farming techniques, utilise farm inputs and budget to afford costly planting materials such as fertilisers. “Smallholder farmers are marginalised from everything and have extremely limited access to inputs or market information. The farmer is successful in proportion to access to inputs and value chains. Farmers without access to seed and fertiliser will not succeed,” Stephanie Hanson, director of policy research at One Acre Fund, told IPS. According to Hanson, 98 percent of clients pay their loans on time, which is a good indication that the majority of farmers are increasing their income per half hectare. Traditional conservation approaches are also being reinvigorated by organisations like Farm Africa, a charity that works with small-scale farmers across the continent. Smallholder farmers in Kitui, a semi-arid area in eastern Kenya, have received training in building earth structures that help capture as much rainwater as possible during a short downpour. These structures, or micro-catchments, come in the form of terraces and small pits or zai pits, which are filled with topsoil and manure to make a fertile, absorbent planting bed for crops. “The project is designed to help smallholders improve their resilience to drought in arid and semi-arid areas, which are being increasingly hit by the effects of climate change. Areas like Kitui have become a priority and we are working to improve the ability of some 7,000 households in the region to cope with drought,” Matt Whitticase, the communications officer for Farm Africa, told IPS. According to Whitticase, there has been a trebling in crop yields thanks to this training and new farming methods. “Increased yields mean that families have an additional month of food from their harvests, meaning farmers have more money to spend on essentials such as buying animals and essentials for their farms,” he said. Electronic cash transfers have been helping elevate subsistence farming to a profit-generating activity in Ethiopia under the country’s Agricultural Transformation Agency (ATA). Last year, 10,000 of the poorest, food-insecure people in Ethiopia received electronic money transfers directly into their bank accounts for the first time. This is an intervention aimed at the country’s previously “unbanked” or “under-banked” farmers. “A profit-generating business requires access to financial services. In order to grow, every small business needs credit and banking services, whether it’s to invest in necessary infrastructure, improved inputs, seeds and fertiliser, or to fund expansion efforts,” Khalid Bomba, chief executive officer of ATA, told IPS. Electronic transfers are conditional on the recipient’s pledge to participate in public works that improve community assets, boost food security, and combat the effects of drought. The Ethiopia government’s cash transfer programme, which has been operating since 2005, aims to reduce food insecurity by providing transfers to over 7.5 million people. However, Henderson warned, there is a risk that making Africa’s smallholder farmers dependent on value chains could skewer the impact of well-intentioned interventions as these chains are bound to market forces and could expose hungry communities to volatile global food prices and the rapacity of large multinational agricultural companies. He was concerned that despite the range of support being offered to boost food security in Africa, insufficient support was being given to smallholder farmers.